Martin’s Properties complete mud, sweat and tears on behalf of Elifar! On the 28th of July, after 103 km of running, walking (and a bit of crawling!) 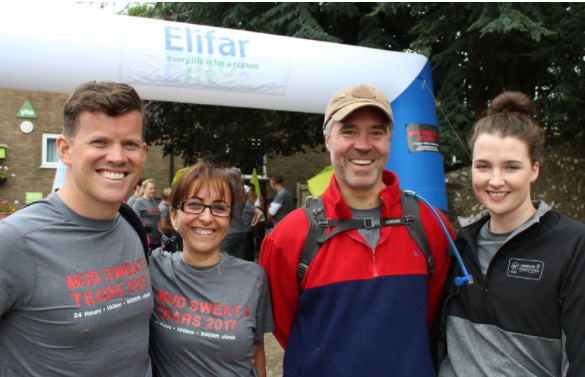 Martin’s Properties completed the Mud, Sweat and Tears race organised by the outstanding charity, Elifar in 4th place! The event, an incredibly tough physical and mental challenge aims to raise money and improve the lives of children and adults with severe learning difficulties and associated physical disabilities. The money raised gives financial and emotional stability to families through life changing help, one of the many reasons the team were delighted to take part and raise money on their behalf. The Martin’s Properties team which comprised of Richard Bourne, Armanda Keith, Tom Martin and Kim Stanton, completed 103 km in a whopping 23 hours and 57 minutes, adjusted for time bonuses through mental challenges, walking non stop through day and night. As a result, they raised an outstanding amount of over £6,000 for the charity. Despite the aching legs, tiredness and the blisters, it was an incredibly worthwhile experience for an outstanding cause. On behalf of everyone in the team, thank you for all your generous contributions that made this fantastic experience all worth it!